its all about find buyers for what you sell! Why us? | Why Web Marketing? Place Your Advertisement on Yellow Pages Now! Subscribe / Advertise with Largest Yellow Pages Network of Pakistan & let your buyers find your products & service. Your business data & website will be automatically translated from English into 22 International Languages, such as; French, Spanish, German, Italian, Portuguese, Japanese, Korean, Dutch, Greek, Russian, Chinese Simple, Chinese Traditional, Turkish, Bengali, Hindi, Thai, Malay, Filipino, Persian, Arabic & Urdu, . Our Yellow Pages are the easiest and quicker way for people to find businesses, Products & Services online they are looking for. We also provide company history, strength & business background. It is why compared to other search engines, Findpk delivers more online customers that are Ready to Buy. Beside the information & entertainment in average 60 Million Plus hits by dedicated consumers who surf through 3 Million Plus pages of our portal every month (about a million Findpk pages are listed on Google). These visitors from 150+ Countries are serious buyers and sellers looking for your products and services. Every day in averages 300,000 Plus Companies, Business, Products & Services are being searched on Findpk Yellow Pages Network. Subscribe Now from Only Rs 300/Month! CCOL | A VISION OF FUTURE! CYBER CITY ONLINE [CCOL] is a company behind Yellow Pages of Pakistan, Premier Web Development, Hosting, Domains, e-Commerce, Multimedia Digital Solutions, Search Engine, Portals and e-Marketing Solution Provider Since 1998. If you have any questions or require more information or want to have business with us please do not hesitate to contact us. Thank you. We appreciate your support. Ad Location: It would be placed at Top Brand Watch Home Page , For Top Flash Box the Tariff is Doubled. Admission Open, Enroll on First come First Serve Bases. 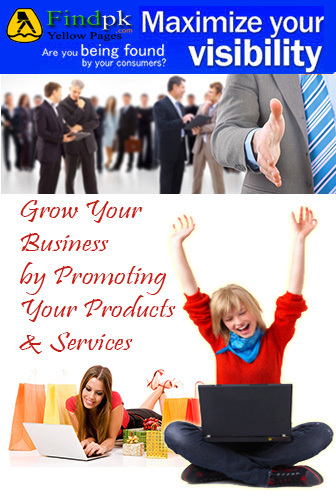 Subscribe your business now in appropriate category! its all about find buyers for what you sell! Note: All form submissions are validated by staff before publishing. Many spammers from overseas and Pakistan are submitting Free Listings (Online Jobs or SEO Links etc.) but in vain, we dump such records. Please do not waste your time and efforts. Only genuine companies/Persons from Pakistan are welcome to subscribe.